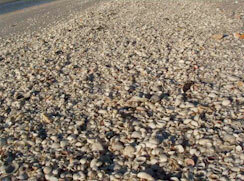 The Sea Shells of Sanibel welcomes you to the world’s best shelling beaches and an absolute dream for nature lovers! While staying at Sea Shells of Sanibel, you will most definitely encounter people doing the "Sanibel Stoop". The "Sanibel Stoop" is the name given to people bent over at the waist on the beach "stooping" to find their next shell souvenir. Gastropods, which consist of a single shell and include shells such as conchs and whelks. Bivalves, which consist of two-hinged shells and include shells such as clams, cockles, and scallops. Find out these facts and more from any of our local experts when you stay at Sea Shells of Sanibel, where the shellers stay!